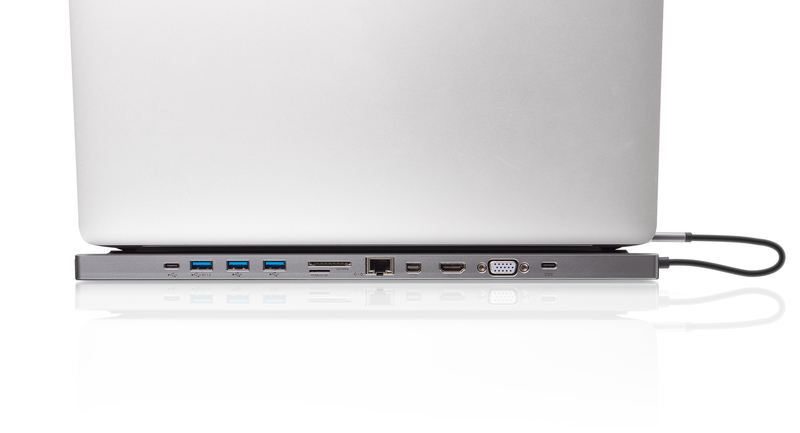 Connect and expand your USB-C laptop to accommodate up to 10 must-need devices. Quickly turn your MacBook or Windows laptop or tablet into a powerhouse of productivity through a single USB-C cable. Connect a wide variety of devices such as a full-sized keyboard and mouse, an external hard drive, a printer, a microphone, headphones or speaker set, and transfer files through its built-in SD/MicroSD card reader. Enjoy the flexibility of the dock’s versatile video options including 4K resolutions through the HDMI or Mini DisplayPort connections or 1080p video through the VGA port. Dock and charge up your laptop or tablet through the docking station via your manufacturer's USB-C AC power adapter and charge a USB device through the BC 1.2 port while you work or play with up to 100W of power delivery pass-through. 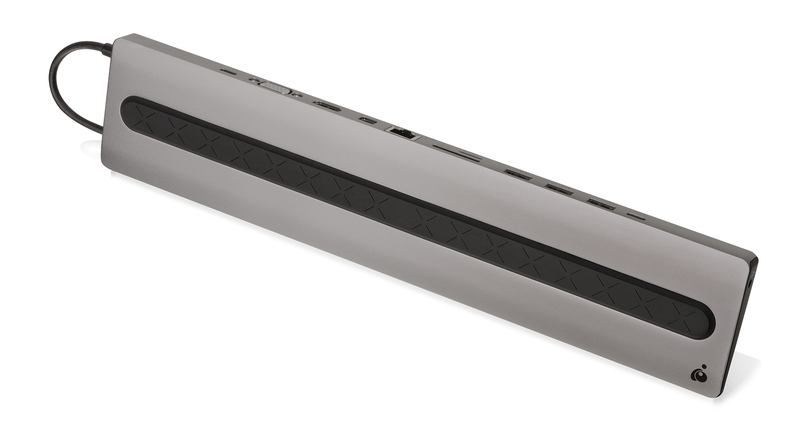 The Dock passes a maximum of 85W of power to charge laptops and tablets as it utilizes 15W of power to operate when connected to laptops and tablets. 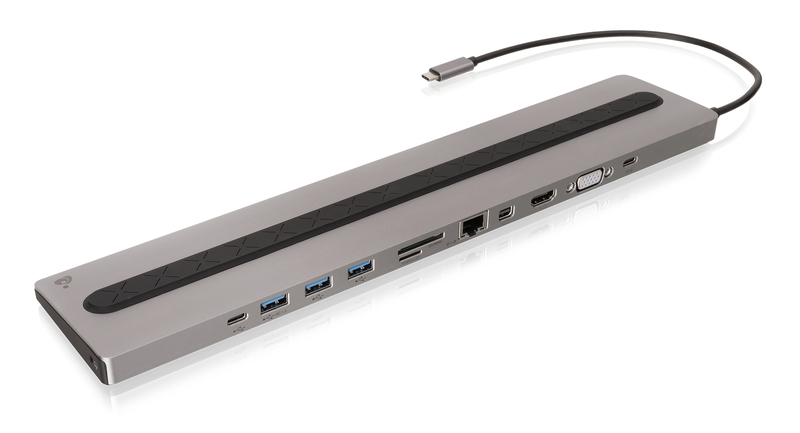 This bus-powered dock is powered through the laptop's USB-C port, connecting all your devices without requiring a separate power supply. 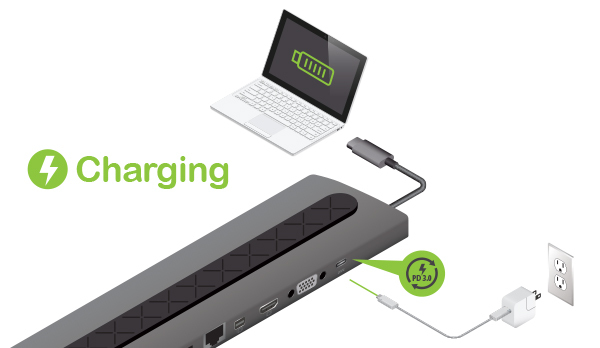 With Fast Role Swap, an advanced feature in the USB Power Delivery 3.0 specification, the dock will maintain power levels anytime it detects a drop below a set threshold such as while unplugging the laptop or tablet's USB-C power adapter from the dock or during an unexpected loss of building power. This feature provides for a safer operation of connected devices while ensuring your work does not get interrupted during power changes. 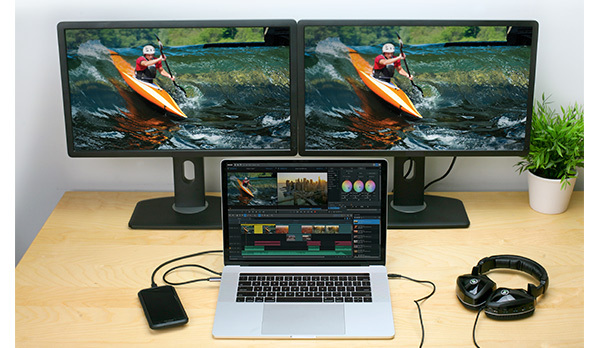 Enhance your work visually by adding a single 4K monitor or dual monitors at high definition resolutions. This IOGEAR Dock offers high-quality image resolutions and enhanced versatility for connection to a VGA (1080p), HDMI (4K) or Mini DisplayPort (4K) monitor. Dock a single VGA monitor for HD resolutions to 1920 x 1200 @ 60Hz and a single HDMI or Mini DisplayPort monitor for 4K resolutions to 3840 x 2160 @ 30Hz. Add two monitors via HDMI and Mini DisplayPort for dual HD resolutions to 1920 x 1080. The USB-C Docking Station with Power Delivery 3.0 boasts an innovative, slim design that saves desktop space. Store your laptop directly on the Docking Station’s non-slip silicon rubber pad or next to your monitor for a neat, minimalist workstation. * Power Delivery pass-through requires USB-C charger from your laptop. 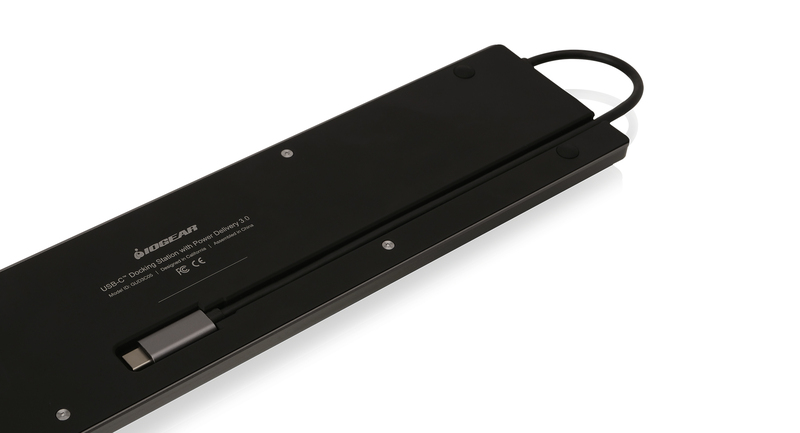 A total of up to 85W can be charged to the laptop after deduction of 15W is used by the dock. 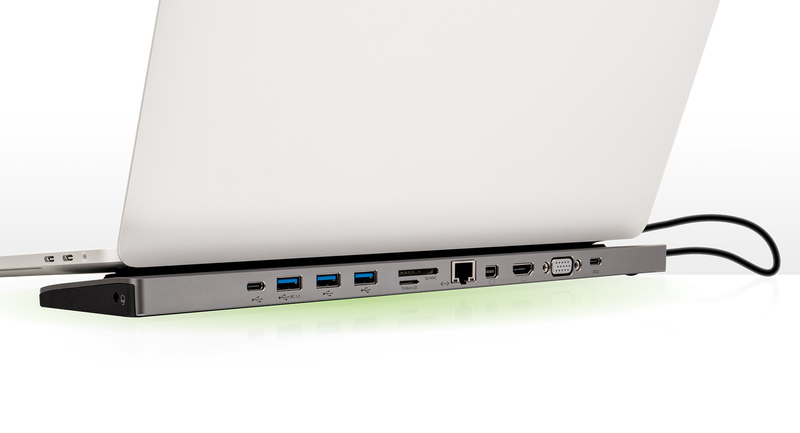 ** Pass-thru power delivered to the laptop is dependent upon the capacity of your USB-C power supply. Ex. If your USB-C power supply is 60W, then the maximum power can be delivered to the laptop is 60W-15W = 45W. If your power supply is 87W, then the maximum power can be delivered to the laptop is 87W-15W= 60W. 3Only one additional video output is supported for extended desktop on macOS X. 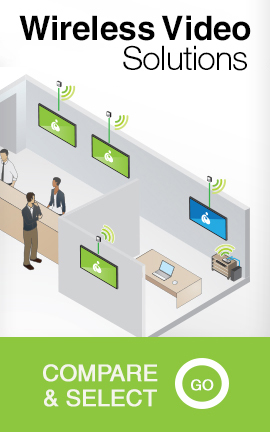 Note: For best video performance, it is recommended to have direct connection between your external displays and the docking station, without using an adapter between the docking station and the display or video cables.